LISTEN TO THE PODCAST ONLINE HERE, OR BETTER YET SUBSCRIBE TO THE PODCAST ON iTUNES HERE. On this week's podcast, I talk with historian Steve Luckert, a curator at the U.S. Holocaust Memorial Museum in Washington, DC. 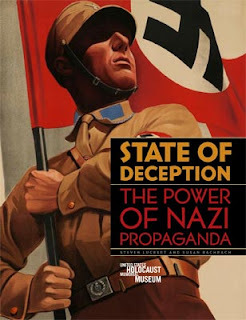 We spoke about the museum's permanent exhibition, as well as about an exhibit Steve curated called "State of Deception: The Power of Nazi Propaganda." Click that link for the online component of the exhibit, and for information on buying the companion book. I'm fascinated by history museum exhibit design, and a museum about the Holocaust presents special challenges. Auschwitz survivor Elie Wiesel, who was instrumental in getting the museum built, has said something to the effect of, 'We can never really tell the story of the Holocaust, but we must always try.' (I'm paraphrasing from a lecture he gave years ago.) It's a theme in his work: the event was so huge and so unimaginable, that ultimately all that survivors and witnesses and the historical record can convey are fragments, or perhaps we can only receive fragments, given our limited time and understanding. But the fact of the stories we tell and hear being mere fragments should not stop us from telling them. How does the U.S. Holocaust Memorial Museum deal with this and other design challenges? How does it try to tell the many stories of the Holocaust?